A network switch is a small hardware device that joins multiple computers together within one local area network (LAN). A switch normally has numerous ports, with the intention being that most or all of the network is connected directly to the switch, or another switch that is in turn connected to a switch. 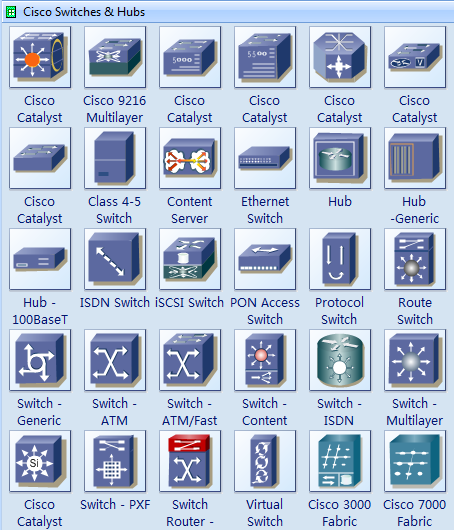 Cisco uses its own brand of switch symbols. Since Cisco has a large Internet presence and designs a broad variety of network devices, its list of symbols is exhaustive. For CISCO specific network drawing diagrams, Edraw is supplied with CISCO specific switch symbols. Different models of network switches support different numbers of connected devices. Most consumer-grade network switches provide either four or eight connections for Ethernet devices. Switches can be connected to each other, a so-called daisy chaining method to add progressively larger number of devices to a LAN.